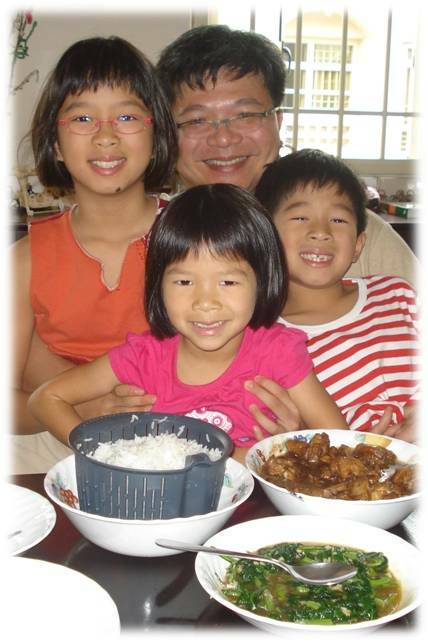 I wanted to take the opportunity, now that we are leaving, to introduce to you two of our homeschool partners. They have come alongside us and enriched our journey and now that we are leaving, they have a few free slots if you want to engage them! 🙂 Both already teach a good number of homeschoolers and enjoy teaching “our kind”. 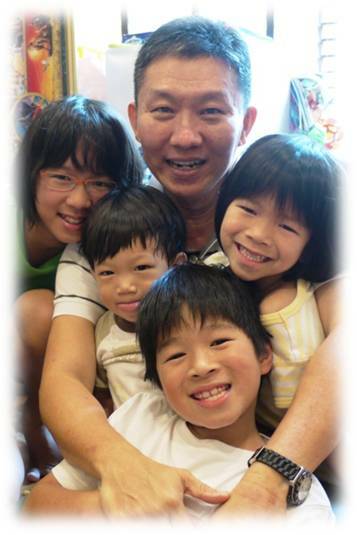 Peter Tang came highly recommended by two other homeschoolers, both with pre-school aged boys. They described him as engaging, unconventional and fun! 🙂 At that time we had no intention of starting our children on formal piano lessons, so I simply passed his contact number to anyone else who asked me if I knew of a good piano teacher. Then one day Tim declared that he wanted to learn to play the piano. Alethea agreed and Nathalie, not really knowing what she was getting herself into (haha!) said she was also keen. So I pulled out Peter’s number and called him. He turned out to be an old church friend! (Small world) Actually he was married to a church friend and they have 3 daughters. Anyway, we started lessons mid-year this year and the kids have LOVED it! Peter is really fun – they sing silly songs (which are ridiculously catchy), they laugh (a lot! ), they play songs they really want to play (he find pieces he thinks will engage the kids), and overall, he helps them maintain a very high motivation for wanting to practice and to do their theory homework. And he is exceptionally calm and patient. Which I’m NOT when it comes to helping kids with their piano pieces. All in all, he has been terrific! But in a short phone conversation, and despite my broken Chinese, Liu Lao Shi seemed to get it! And we have not had a single regret all these years. She is nurturing, and kind and patient. She is positive, and encouraging and motivational. She “gets it” about what we are trying to do with our children. She gets that we want them to enjoy the language, to enjoy good books. 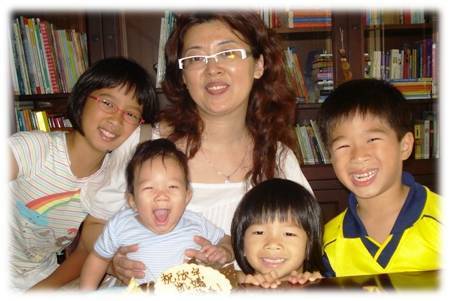 But at the same time, she has a good reputation in turning children around who have had issues with learning the language and many of her students do exceptionally well in the PSLE. This year, when we wanted to place more emphasis on the local curriculum with Alethea, we had her come twice a week instead of just once. One session she does what she has always done. She reads to them and they read to her. The other session she goes through their assessment work with them and teaches them test-taking techniques. How to read a comprehension passage, how to eliminate answers in a multiple choice format question, how to compose sentences etc. We are so going to miss these two lovely people, and we recommend them highly. If you would like to contact them, please email me at angiefm@gmail.com for their contact numbers. Montreal … HERE WE COME! Yup! 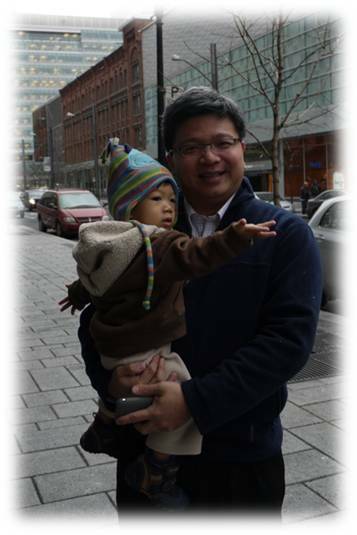 The Ng family is relocating to Montreal, Canada in January 2011! Tee Chiou has been posted there to work at the International Civil Aviation Organisation. We should be there for 3 years. Snow at last just when we were waiting to take a cab to the airport. There’ll be LOADS of it when we get there in January! I have a favour to ask of you all. If you know of anyone who wants to rent our 3 bedroom condominium apartment on Jalan Loyang Besar in Pasir Ris, can you please have them email me at angiefm@gmail.com? The apartment will be available from 15th Jan 2011. So if you know anyone looking to rent an apartment, please let me know at angiefm@gmail.com. Thanks in advance! 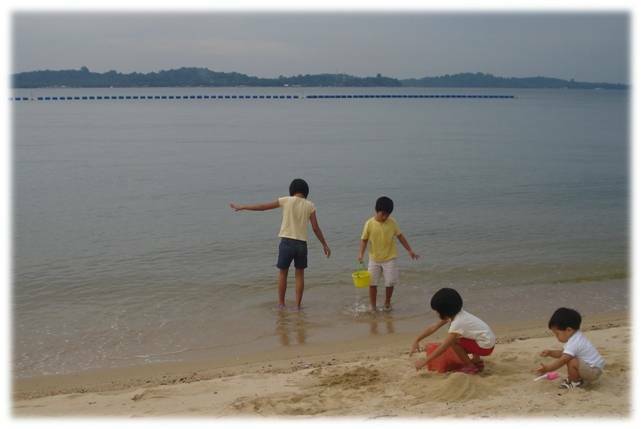 Last year, I put together a collection of stories, biographies, pictures, copywork selections, etc and blogged about it here: https://teachingourown.wordpress.com/2009/04/07/a-month-with-cm/. Since then, a number of people have asked me for the book but I have not had the time or the energy to print it. And they have asked me for the file, but I couldn’t figure out how to send such a large file. the timeline figures in the book are used with permission from Home School in the Woods, www.homeschoolinthewoods.com. They are for your personal use only. The original printed version of A Month With Charlotte Mason came with timeline pages as well, but I cannot put those into this pdf version since the pages are protected by copyright. You can buy your own copy of the timeline notebook from www.homeschoolinthewoods.com, or make your own. Visit www.simplycharlottemason.com for a free (but not half as nice) book of centuries. the file is HUGE! Be VERY PATIENT. There is nothing wrong with your computer! As with the copywork file in the previous post, if you could leave feedback on this one also, that would be super! Still busy today (I try to blog on Saturdays), so I thought I would do this one quick post on copywork which has been at the back of my mind for AGES! In our homeschool, in learning English, our children do not do spelling lists like they do in school. Nor do they do workbooks (yikes! ), or for the first few years write compositions. Charlotte Mason’s methods are different. In a nutshell, for English, we read great books, do copywork/dictation, and require narrations. What I did want to add was our own copywork selections, so that if you are inspired after reading Sonya’s blog, you can just download ours and get started! I only had time to clean up the one our kids use in K2 or Primary 1. 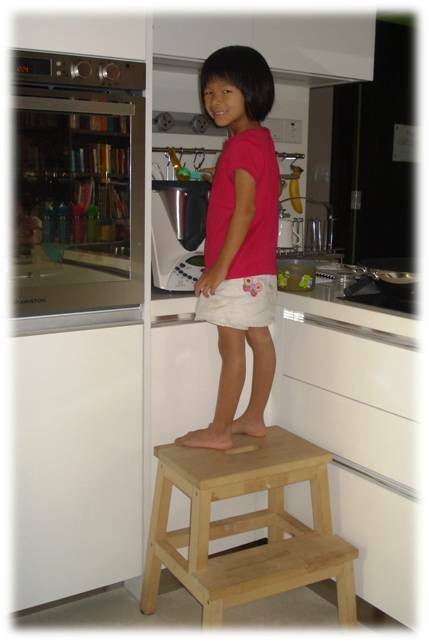 Before that age, we do not do much “seatwork”. I will post the selections for older children in the coming weeks. If you want to read more about copywork, I have an older post on the topic here. What you will want to do is to read each day’s selection with your child. Explain, highlight new words, discuss meaning, answer questions your child may have. Talk about punctuation, capitalisation, spelling of unusual (non-phoenetic especially) words, etc. No hard and fast rule. It’s all done very casually. Where the selections are longer, I have put in bold the words I want them to write, but left the rest in there for context. My rule of thumb is whatever they can reasonably complete in 10 mins of focused writing. Any more is pushing it. So feel free to vary the lengths for your child according to his/her ability. You can also extend it by having your child memorise selections – a Bible verse, a poem, etc. Memory work is great for this age and they learn so fast! Remember to insist on their very best handwriting. And no mistakes. Sit there with them and be sure to cover up any mistakes made or preempt by stopping them in mid-word if you see a mistake coming up, and asking them to look again at the word before writing it. They improve so much during the course of a year that they will probably go from copying letter by letter, to copying word by word and then phrase by phrase. Let them dicate the speed at which they progress, but they should get to copying whole words and not letter-by-letter quickly because that’s where the real value is. Once they start seeing the whole word, their spelling will automatically be taken care of. We have never done spelling lists in this house and our kids spell well. All credit to copywork! And copywork can be so inspiring! Select that which is worthy of thought. It is amazing how many times my children have quoted copywork selections to illustrate a point. Like recently, Alethea told Tim, “Whether you think you can, or whether you think you can’t, you’re right.” And Tim said, “Hey! I did that for copywork!” Actually, since we use the same selections over and over again, our children have lots to share! When we were in New Zealand almost 3 years ago, we were sitting in the shadow of a building and the kids were feeling chilly, so Alethea stepped into the sunlight, stood there a while and said, “This reminds me of something I wrote for copywork: ‘It was one of those March days when the sun shines hot and the wind blows cold: when it is summer in the light and winter in the shade. '” It was a Charles Dickens quote! PRICELESS! I hope this inspires you to start using copywork with your children! If you download the file and use it, I would love to hear your feedback on it. And if you find a mistake in the spelling, please send me a comment to let me know so I can update the file for future downloaders. Remember we are looking for BRITISH spelling here, not American. 🙂 Looking forward to reading your comments! This is it! The post you have ALL (yes, all three of you) been waiting for! My rave review about the Thermomix. It is advertised to be the world’s most advanced kitchen appliance and I couldn’t agree more. 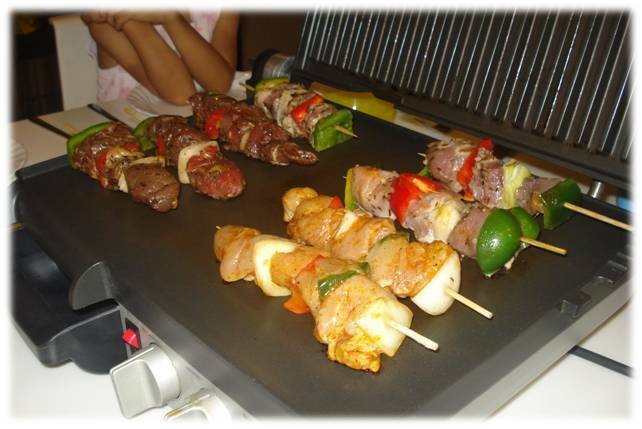 It chops, beats, mixes, whips, grinds, kneads, minces, grates, juices, blends, heats, stirs, steams and weighs food. 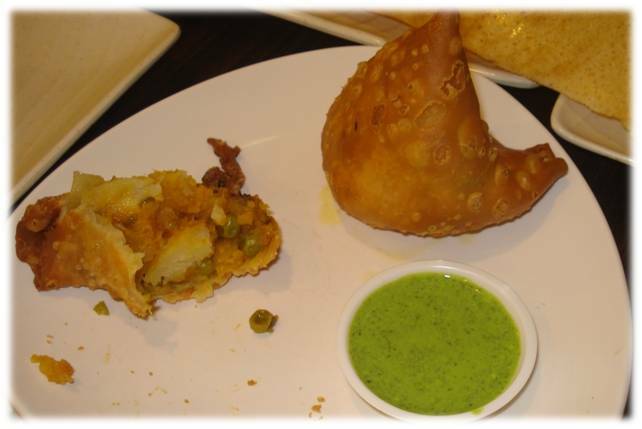 Apart from deep-frying and baking, there is little else that the machine can’t do. Since we bought the Thermomix, I have given away our super Kenwood mixer, rice cooker and ice cream maker, and I no longer use my kitchen scale. I no longer have to chop garlic (though I still do it sometimes because I find it very therapeutic. :)), and I hardly use pots on the stove to steam our food. Back in February, a friend forwarded me an email she read on a forum from a full-time working mom with 5 children who lives in a 3-storey house and manages sans maid. Here in Singapore! In the email she shares how she manages various household tasks, but the one thing that intrigued me was her mention of a gadget called the Thermomix. I started looking it up online, watched a bunch of videos on youtube and other websites, read reviews then after consulting with (read: begging) TC, we decided to go for it! There was a bit of urgency also, since Thermomix’s closest distributor is in Malaysia and TC was going to KL the next week and we decided it would be easiest and cheapest if he carried it back instead of having them send it here. The one thing I took a while to find out while I was surfing the web, was the price. And since it is the first thing people tend to ask, I thought I should tell you right off the bat. 🙂 The Thermomix costs RM 4898. That’s Malaysian Ringgit. If you pick it up practically anywhere in Malaysia (we had ours sent to the hotel TC was staying in), that’s what it will cost you. If you have it sent to your home in Singapore, it will cost RM 5465. The additional costs are to pay for courier charges and GST. In Singapore Dollars at current money-changer exchange rates, that would be S$2130 if collected in Malaysia and S$2376 if sent to your home in Singapore. Even little Nathalie makes fabulous mashed potatoes, (I peeled and cut the potatoes for her but she did the rest) and potato and leek soup. 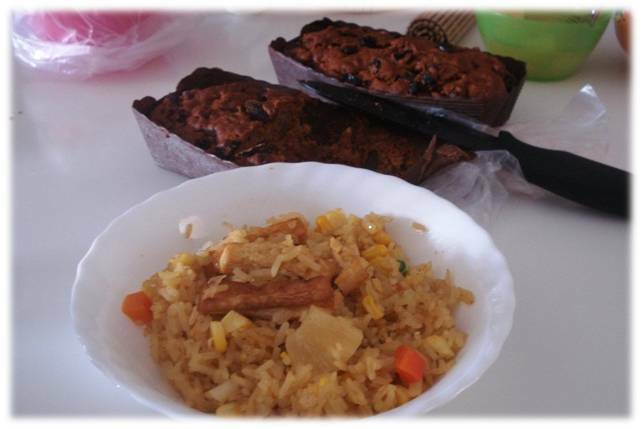 Alethea has cooked tuna pasta, pei dan chok (century egg porridge), made banana, pecan and date bread (you make the dough in the Thermomix, then pour it out into a loaf pan to bake in the oven), a variety of soups, lemonade, ice cream and many other dishes. Last night, she made cauliflower soup for dinner without any assistance! It’s child’s play because the recipes are so easy to follow, everything is weighed directly into the machine (there is a built-in scale), the ingredients are very simple to prepare because the machine does most of the processing. For example, you don’t have to pre chop garlic and onions because the machine does it for you. There are three essential parts to each step – temperature, time and speed. And the cookbook tells you exactly what to choose. When the machine beeps to signal the end of the time, you simply move on to the next step. So all you’re really doing is pressing buttons! We use to buy grated Parmesean cheese (which is more expensive and doesn’t taste as nice), but now with the Thermomix, we buying the cheese in wedges, because all you need to do is break it into pieces, throw it in, pulverise it for 3 or 4 seconds and you’ll have perfectly grated cheese! Also I used to buy icing sugar for the occasional recipe which calls for it. Now I put in castor sugar, pulverise and out comes icing sugar. No waste. I have also started making our own mayonnaise and it is amazingly cheap to do. 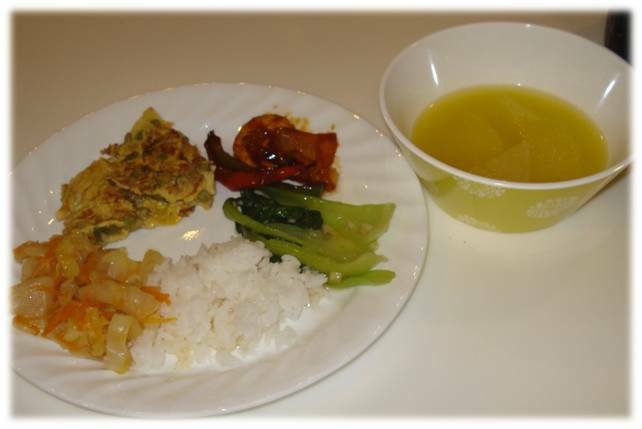 The main ingredients are sunflower oil, an egg, vinegar and mustard. I used to buy chicken stock in cubes and in liquid form but I have recently made my own vegetable and meat stock concentrates and no longer need those. 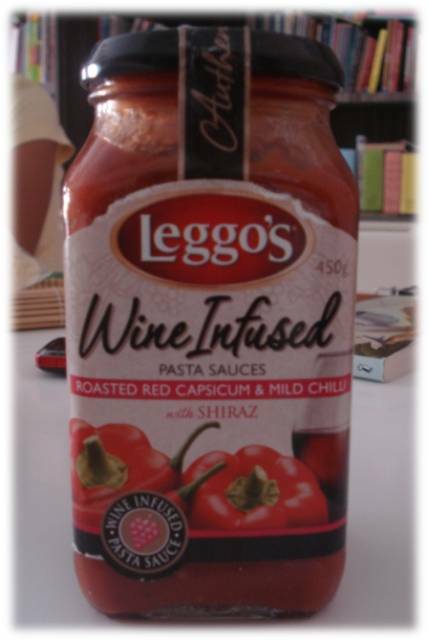 Best of all, I know exactly what went into the stock concentrates I made so I know what’s seasoning my food! 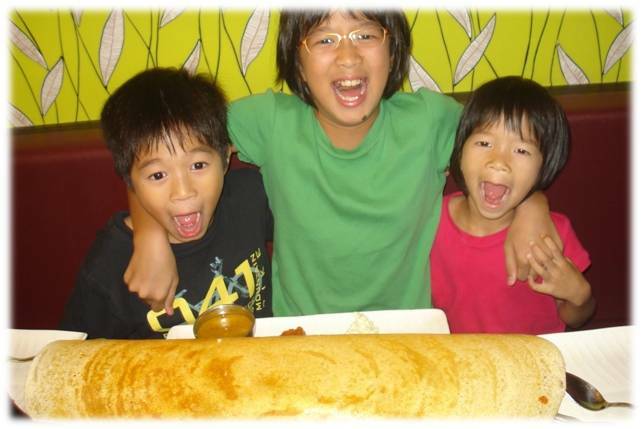 We make lemonade, smoothies from frozen bananas we couldn’t finish, pancake mix, pizza dough, ice cream … the list goes on! And because it is so very easy, I now make my own bread once a week. That said, I have had many a skeptic tell me that 2000 dollars can buy a lot of lemonade. 🙂 I have no convincing response to that. 3. Turns you into a professional cook, thanks to idiot-proof recipes! Marinate chicken with seasoning, set aside. Easy peasy! And you get perfect results each time, no matter who’s cooking. With the Thermomix, everything is contained within the pot. You even measure ingredients right into the pot with the help of the built-in scale. So there is very little mess (unless of course you tend to spill while pouring, in which case I really can’t help you. :D). You don’t have to use a variety of bowls or plates or measuring cups and spoons to measure or hold pre-weighed ingredients, so there’s less to wash. Whether you’re frying, or boiling or steaming, everything stays within the pot and it never boils over because of precise temperature control. Your countertop stays clean! No oil splatters! Even better, the pot practically cleans itself! After cooking, just put half a litre of water in, together with some detergent if it’s oily, turn on the machine to speed 6 for 30 seconds, empty it, and all that’s required is a quick rinse. If you have to take the machine apart to wash, there are very few parts involved. Cover, pot, blade and base. And everything is dishwasher friendly, so if I have space in the dishwasher at the end of the day, I simply throw it in. The only times I have to take it apart are after I cook porridge and make bread dough, because some of it invariably gets stuck under the blade. But otherwise, the quick rinse is all that’s needed. 5. Expand your repertoire with just one machine! Because the recipes are just too easy to follow, I find myself making loads of things I wouldn’t otherwise have tried. Sorbet, mayonnaise, vegetable stock concentrate, kaya, rempah (chilli paste), sambal belachan (more chilli), pizza dough (used to buy ready-made bases but not anymore), cream of mushroom soup, bread, etc. The Thermomix has a huge following, so there are many recipe sites online, like www.forumthermomix.com, so you’ll never run out of things to try. The Thermomix is a multi-functional machine, so you don’t have to take out a lot of different gadgets to cook. For example when Alethea made cauliflower soup last night, she weighed in the cauliflower florets, poured 300 grams of water in without needing to use a measuring cup, measured oil and butter in using the scale, then when it was cooked, she simply turned up the speed to blend it into right consistency. When we used to make it previously, we would cook it on the stove-top, stirring occasionally to prevent it from sticking to the bottom and burning, ladle it carefully into the blender (which we had to take off the storeroom shelf and out of the box), blend it (with care because you have to hold the top of the blender down to avoid splatters), pour it back into the pot before re-heating and adding cream. Now cauliflower soup takes us 20 mins to make and almost all that time it is unattended! So there you have it. My RAVE review of the Thermomix. 🙂 Happy Cooking! Draw Write Now is a series of 8 books by a mother-daughter team which teaches penmenship and drawing. We have owned it for some years now, but Alethea and Timothy didn’t quite get into it. Tim doesn’t like drawing. Full stop. Alethea prefers writing, then doing her own illustrating. She wasn’t keen at the time to learn drawing through this step-by-step method. When Nathalie ran out of copywork passages to do, I pulled this book from off the shelf as a stopgap measure to buy me some time to pull together more copywork selections. And she is THOROUGHLY enjoying the book! In fact, I catch Alethea and Timothy looking over her shoulder in obvious interest as she draws. We have the first in the series, Draw Write Now Book 1: On the Farm, Kids & Critters, Storybook Characters, which is recommended for 6 and under, and introduces basic drawing techniques. If your child is 6 and under, or if he/she is new to learning drawing this way, or just not the drawing type, they suggest starting with Book 1. Otherwise, the other books are not in any grade order, but based instead on various history and animal themes. If you are keen to check the series out, their website is www.drawyourworld.com. It is available locally through your friendly neighbourhood (if you live in Woodlands, that is :)) homeschool resource store, www.lifebetweenthecovers.com. Using pre-mixed seasoning for pineapple rice, I simply used fried tofu instead of chicken and voila! Lunch! 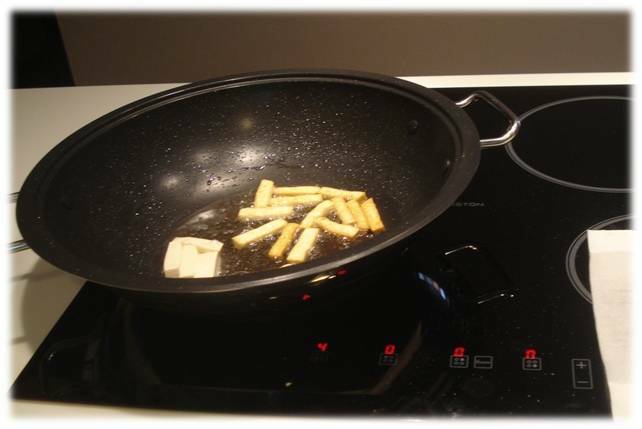 Tofu frying on my Ariston induction stove. Tim wanted to go to Casa do Churrasco Brazil for a celebratory dinner. 🙂 Think MEAT! Instead, I decided to order in a surprise dinner for the family. Still think MEAT! I went online (I love online shopping!) to www.espiritosantobutchery.com.sg and ordered a barbecue pack for 5 plus some extra ham/beef/lamb burger patties to make the 100 dollars needed for free delivery. 🙂 We ate just under half of all that we ordered and it was YUMMY! The last bit of my sirloin steak. Medium Rare, thank you. Hats off to all the vegetarians out there! Part of this initiative was also to get our children to empathise with my mother who has been on a ZERO protein diet for about a year now and will have to be on it for life to prevent kidney failure. That’s ZERO plant protein also! So no tofu, no dairy, no beans etc. Even though the kids have known about her diet, it only hit home this week how difficult it was for her. I used more oil this past week than I have in the past 2 months! Really shocking! I found myself wanting to fry everything to make it more palatable. Deep fried potato cakes, deep fried toufu, deep fried tempura vegetables, more deep fried toufu … That meant more cleaning than I usually do also. I do stir fry a lot, but I don’t deep fry much. I have learnt to use so many different types of vegetables in so many different ways this past week. We have added to our repetoir of dishes and some are definite keepers! 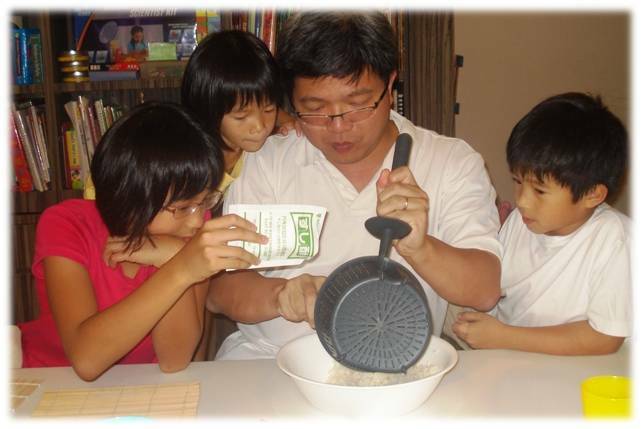 I am inspired by my children’s willingness to try new things, and I am going to keep adding new dishes to our menu. 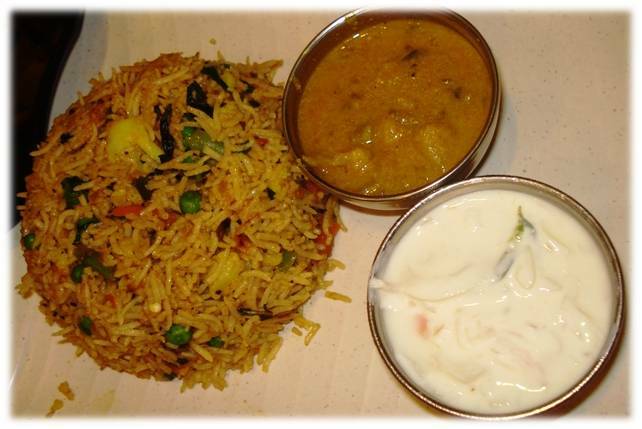 Our meals have become same-old-same-old for a while now. Projects are fun! TC and I are always talking about our latest projects. Everything to us is a project. Ha ha. From reorganising a room, to trying out a new gadget, buying and using a new curriculum, going vegetarian for a week. Projects really inject a good deal of fun and excitement into the day. There is lots to talk about, lots to research, and all that rah-rah brings the family together. My parents took my kids out for their weekly lunch outing yesterday. They wanted to take them to IKEA, a favourite haunt, but what was there to eat at IKEA that was vegetarian? Apart from their one daily vegetarian offering I mean. So instead they went to Downtown East and ate at the Nihon Mura Restaurant on Level 5 of E!Hub. As I predicted, my parents tried to get my kids to forget the vegetarian thing for that one meal. But to my children’s credit, they remained resolute! 😀 One point for the children! We were so proud of them when we heard that they refused to be swayed by two very persuasive grandparents! Anyhow, here’s what they had for lunch – plain ramen, assorted vegetarian sushi (with cucumber, tamago, avocado, etc), toufu and an avocado shake. Okay. This one will go down in history. 😀 We had planned a tempura dinner as part of our week, but didn’t count on the MESS we had to clean up afterwards! Tempura flour, batter mix, oil spills and splatters, oily floors, too many sheets of oil soaked kitchen paper towels. It took us an hour to clean up afterwards! 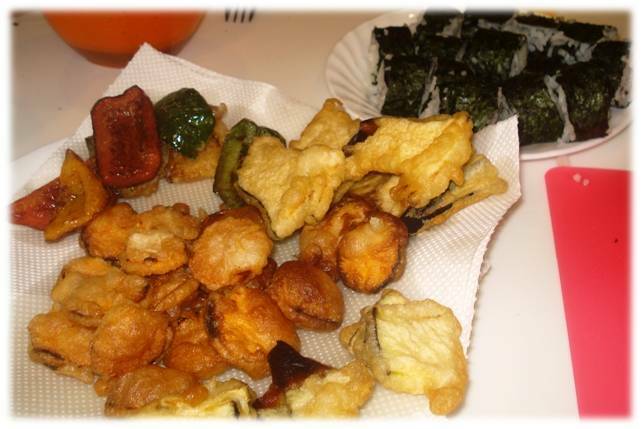 Our plain sushi rolls, assorted vegetable tempura (sweet potato, eggplant, tri-coloured capsicum). I also made a mixed vegetable one from shredded carrots, lotus root, sweet potato, onion, but was so tired and hungry after that was done, I forgot to photograph it. Pity though, because that was the best one! Renkon (lotus root) chips (which were so ridiculously cheap and easy to make that I wondered why we paid so much for them at Japanese restaurants!). There were loads more, but they were snapped up so fast I only had 3 left for a photo. 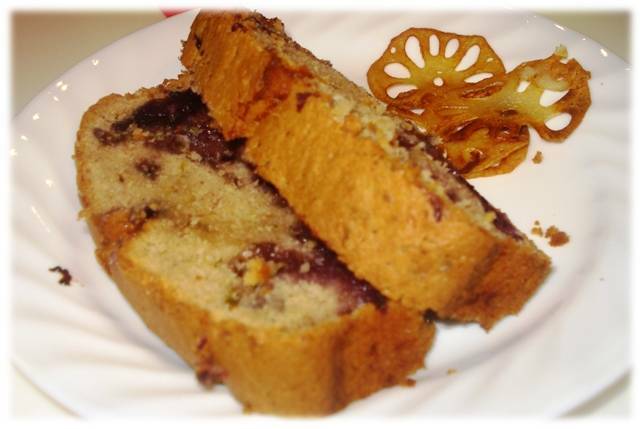 In the foreground is a zucchini and blueberry bread I made using blueberries my cousin Ling brought from Seattle (thanks Ling!) and from a recipe sent to me by Joann (thanks Joann!) The bread was for tea yesterday and for breakfast today. After all that excitement over the food, I completely forgot to take out the steamed corn from on top of the Thermomix! 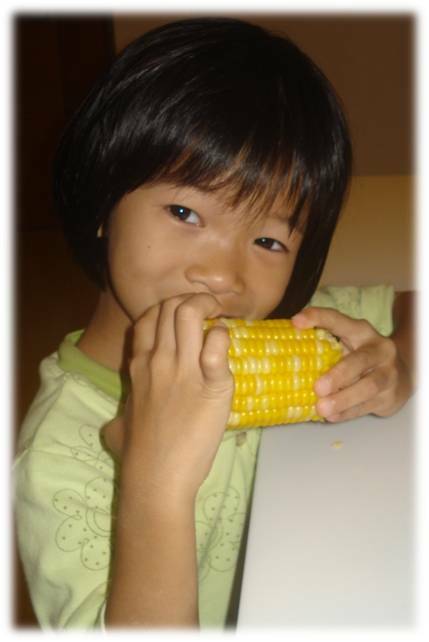 *faint* So here is Nathalie enjoying her corn in her pyjamas at 10 pm when the discovery was made. Thus endeth Day 4. We are now into our 5th and final day! 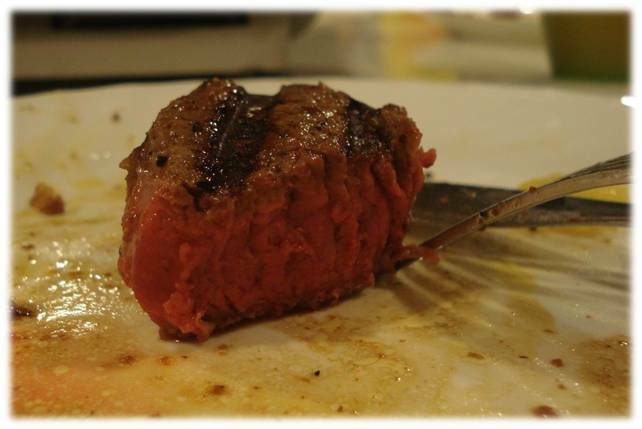 This morning, TC suggested we have a HUGE steak dinner tomorrow to celebrate the end of vegetarian week. From the way Alethea and Tim’s faces lit up, it was clear they were not going to stand for my pushing the 5 day challenge to a full 7. HAH! Yesterday being Teachers’ Day (HAPPY TEACHERS’ DAY to all the teachers and homeschool moms! 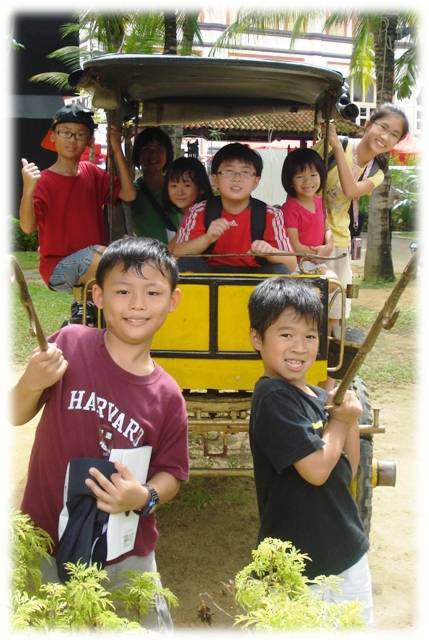 ), we went out with two other families on a Heritage Walk around the Kampong Glam area. A recent (ie 2 days ago) discovery – in Indonesia and Malaysia, it is spelt Kampung with a “u”, but in Singapore, it is spelt Kampong with an “o”. Go figure! 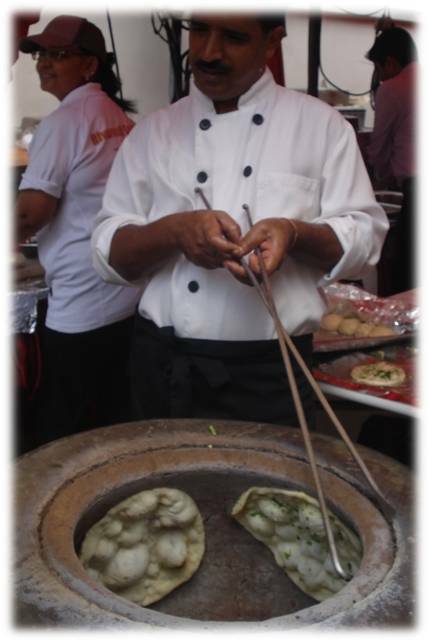 En route to the Malay Heritage Centre, there was a row of food stalls set up pasar malam style along Kandahar Street and there was a TANDOOR! I love naan and would have stopped for some except we had just finished eating at Zam Zam and it was HOT HOT HOT! Don’t know how the guy managed to cook in a tandoor under the scorching hot noon-day sun! Check out the blistering naan in this photo! YUM! Since we knew we were going to end late, we planned to meet TC at the airport (he works there) for dinner at the Ananda Bhavan Vegetarian Restaurant on Level 3 in Terminal 2. We have passed it countless times, usually on the way to eat at its neighbour, Pasta de Waraku which, by the way, serves a very good value children’s set meal which is way too much for one child to finish. 🙂 Ananda Bhavan is almost always crowded, even on weekday nights, so you have to figure it has to be reasonably good. TC has suggested on many occasions that we eat at there, but I have already explained my hesitation about vegetables. But we are on an adventure this week! And I was more than pleasantly surprised! The food was EXCELLENT! 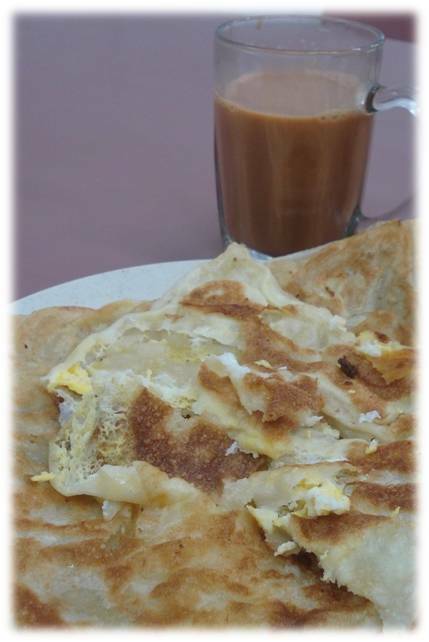 and a huge paper thosai! The kids had a BLAST! Nathalie had a largely carbo meal because she found most of the stuff we ordered to spicy to have much of, though TC and I thought they were all very mild and the older two managed to eat without issue. And they all asked to go back again, especially for the bryani! What a hit! And I’m certainly going back for more Romali! Thus ended Day 3. 😀 The adventure continues! 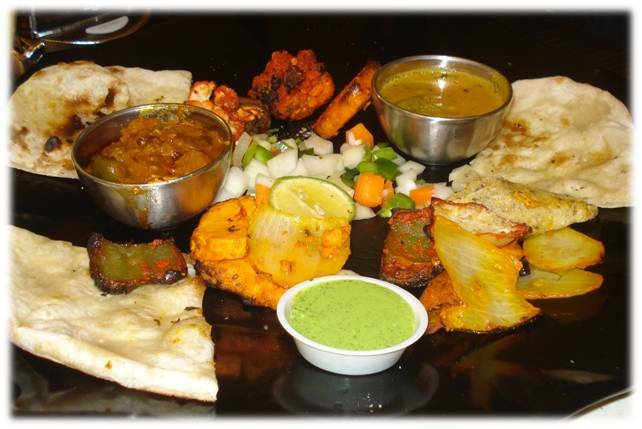 It is the end of our second vegetarian day. That’s 2 out of 5, or possibly 7 days. Though it is looking more and more like 5. 😀 This is harder than I thought it would be! Am totally out of my comfort zone in terms of planning, preparing, cooking, eating … But I am certainly trying lots of new things and expanding my repertoire of dishes. 😀 It is all good. Tuesdays are our ELABORATE BREAKFAST days. We started this practice a couple of months ago and the kids love it! We have a cooked breakfast on Tuesdays – bacon, eggs, sausages, baked beans, French toast – not all at once of course. But bacon and eggs are our must haves. Especially the bacon. 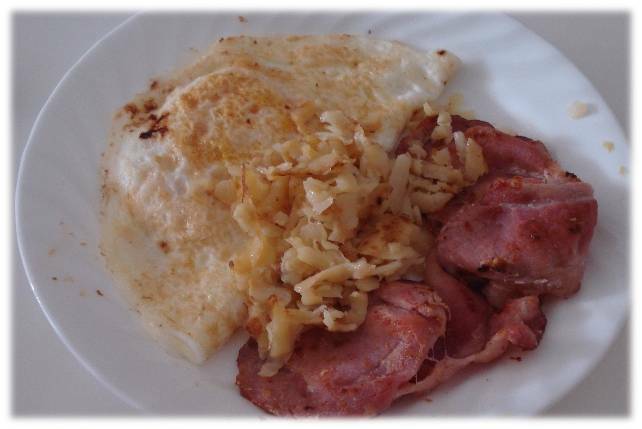 A typical Tuesday breakfast – Bacon, Eggs, Rosti potatoes. But not today. So this morning, when Tim realised it would just be eggs, he asked if we could have broccoli soup in lieu of bacon! Those of you who read our earlier post on our going vegetarian will remember that he was our only dissenter. 😀 So I was quick to say YES to keep him happy and in the game. Fortunately for me, we have the ULTIMATE gadget, which deserves a separate post of its own. Soon. Soon. Wait for my RAVE review soon. For now, let me simply introduce the THERMOMIX. The many-in-one kitchen gadget which I use several times each and every day! Just how cool is it? Well, right after Tim asked for broccoli soup, I went to get two heads of broccoli from our week’s stash of vegetables, cut it up, threw it in, followed a recipe for cauliflower soup (which we made yesterday), and VOILA! 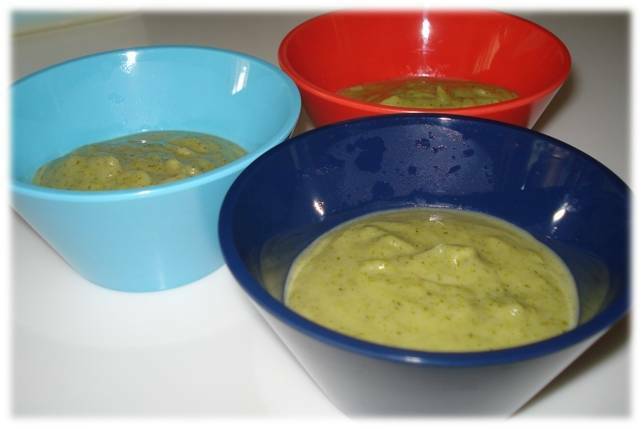 Within 30 mins of his request, we had these bowls of piping hot broccoli soup! 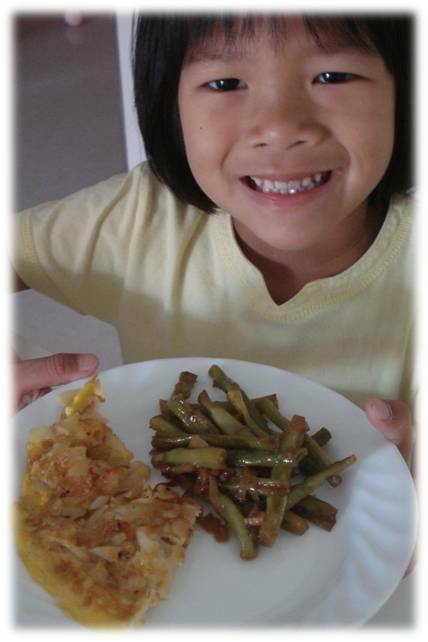 For lunch, I cooked long beans with onions and a rosti omelett. I threw in the eggs to satisfy the protein part of our very balanced meals. 🙂 The kids were skeptical. They like their rosti as is. But they did like the omelett version also. Whew! Also, they were very happy to have the long bean for lunch if I promised to put lots of onions in. My children are very interesting eaters. They LOVE onions, garlic and leeks. Their current favourite dish is all three fried with bacon. But let’s not get into bacon right now. I’m starting to crave meat! Nathalie with her vegetarian lunch. Notice the gleeful look. She’s not missing the meat at all, this one! 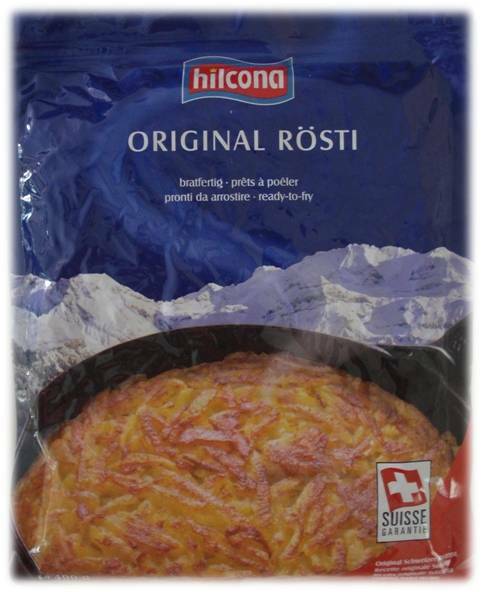 This is the brand of rosti we bought from NTUC. On my plate (clockwise from the rice) are stir-fried (more like “boiled-long”) cabbage and carrots, long bean and onion omelett, sweet and sour egg tofu with tri-coloured capsicum (peppers) and onions and stir fried xiao bai cai. In the bowl was my very feeble attempt to make a vegetable-based soup with winter melon. The children agreed it tasted like water, but finished what they were served. Great kids! 😛 But as soon as possible, I’m going back to my meat bone soups! Stay tuned for more updates through the week!